Would you like to play with clay and learn to sculpt? 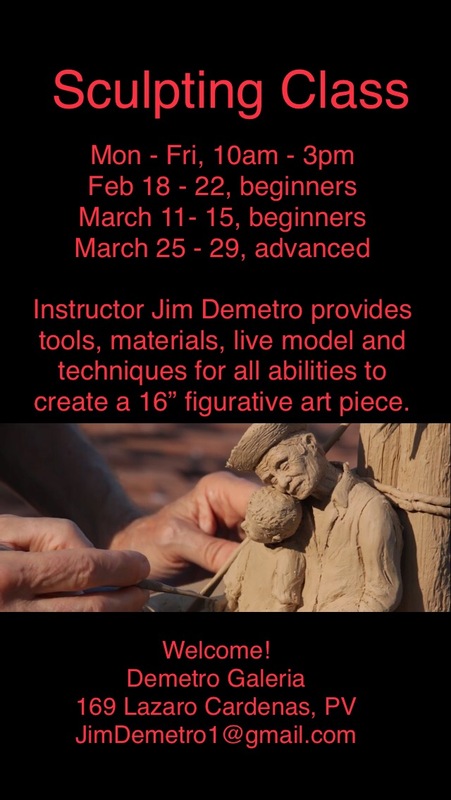 Jim Demetro’s classes are for beginners or those who want to enhance their artistic sculpting skills. The emphasis is on having fun as Jim guides you through the process with a lot of personal attention. Demetro provides everything you need, including a live model, sculpting clay, and all the tools necessary to sculpt a figure about 16″ tall. The end result can be molded and cast in a number of materials such as plaster, resin or bronze, or you can keep it in clay to be worked on later as this oil-based clay never hardens. The class is five days long, Monday through Friday, from 10 AM to 3 PM with a 40 minute break for lunch. The cost is $395 US dollars in cash or the equivalent in pesos. March 25th to the 29th Advanced class for those who have taken Jim’s beginners class. Please email Jim and wife Eva with the week that works for you as classes fill up fast, and it will be first come, first served. Welcome to our Thursday evening artwalks and gallery tour! 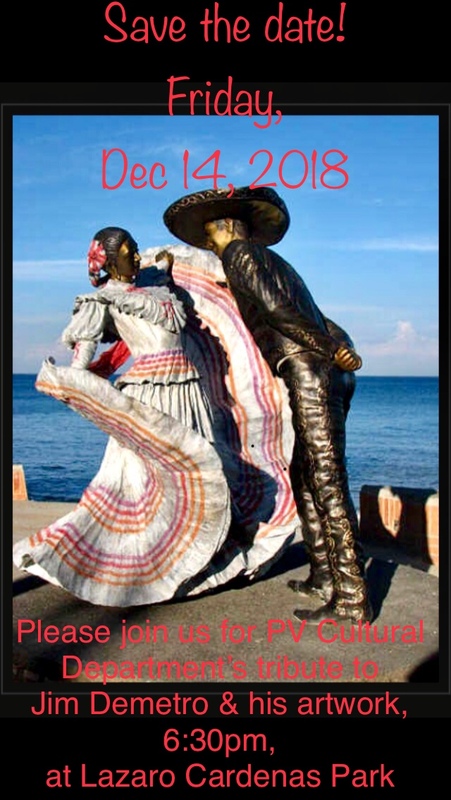 Where: You can join Galeria Pacifico’s Gary Thompson on Aldama #174 for an art walk that ends at our Demetro Galeria, or simply start the evening with our artists, art, wine and appetizers as you explore our gallery. Demetro Galeria y Amigos: Between the pier and the pedestrian bridge over river Cuale, you’ll find Demetro Galeria at 169 Lazaro Cardenas, in Zona Romantica of Puerto Vallarta. 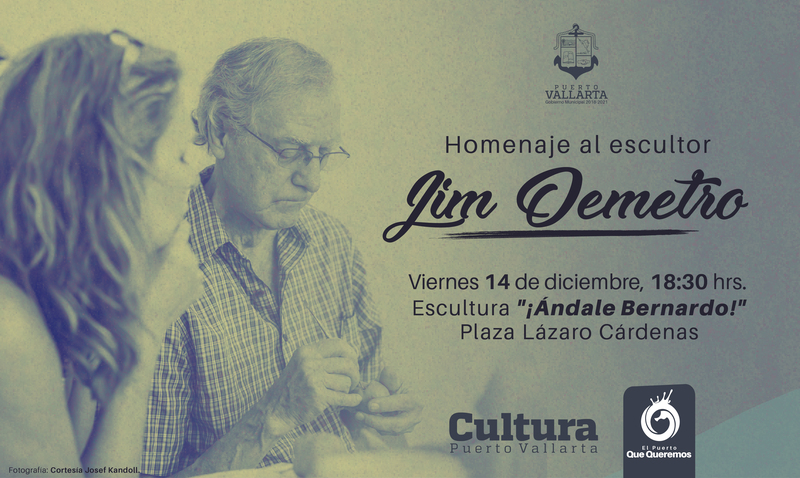 We are on the same street as Jim Demetro’s Andale Bernardo Burro sculpture in Lazaro Cardenas Park and can see the park’s gazebo across from our gallery’s window). We are next door to A Page In the Sun cafe. Welcome! Demetro Galeria on 169 Lazaro Cardenas to discover the new art in our gallery. The Demetro Galeria has a lively Thursday artist reception in the evenings. 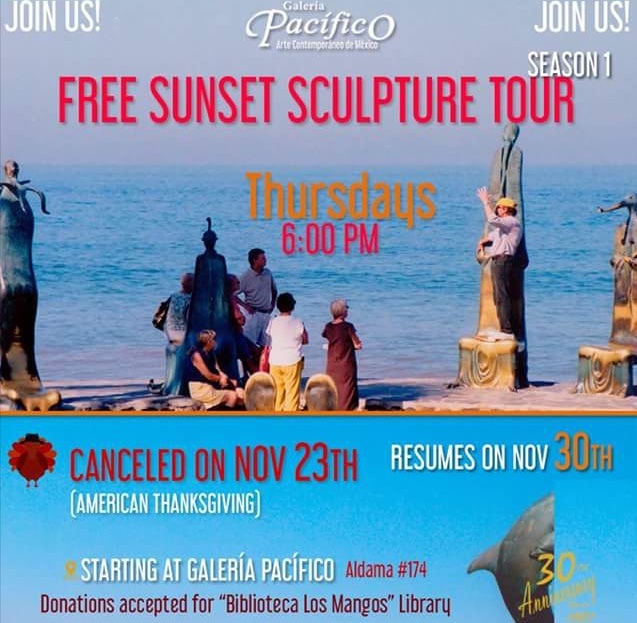 This weekly event follows a sunset sculpture walk that starts with tour guide/owner Gary Thompson at Galeria Pacifico on 174 Adalma Street at 6 pm and ends at Demetro Galeria. The art gallery also provides a sculpting classroom. Beginner and advanced sculpting classes are held January through March. 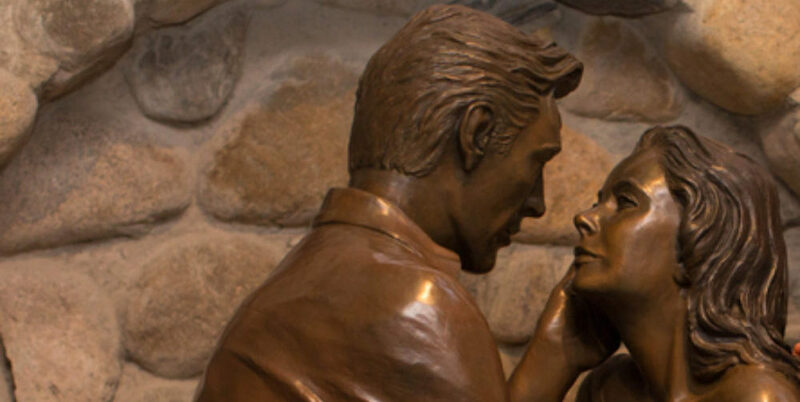 Master sculptor and instructor Jim Demetro provides the tools, materials and live model for students of all abilities to create beautiful figurative art.